The house was constructed in 1973. It is an original Rondesic design, an early Deltec home. It is built on the side of a hill, resting on a steel frame the house is suspended some 40 feet in the front and about 12 feet in the back. This house was built to withstand about anything. The house is wrapped with a 78'x8' deck that leads to flat ground. 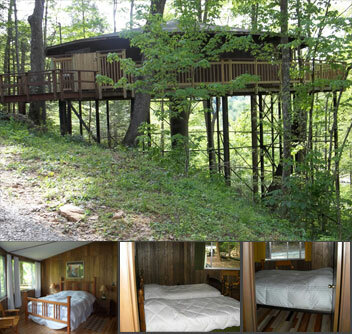 Overlooking the water of Lake Cumberland, nestled in the treetops and bordered by the Daniel Boone National Forest, Treetop Roundhouse stands alone.